Description: NS SD9M 57 stored at De Butts yard. You can see the yellow caps on the exhaust stacks. This unit began life on the Nickel Plate Road. Description: In the dead line, disposition unknown. Description: Stored outisde the Pavonia Yard engine house is SD9m 57 and an ex-Amtrak baggage car. Description: Photo of NS SD9m 57 stored outside of the engine house at Pavonia Yard. 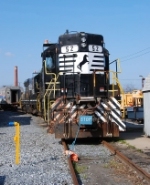 Description: A Norfolk Southern SD9M equipped for remote control awaits disposition at Pavonia yard with an ex-Amtrak baggage car for the Morristown & Erie.